Cross Check Breast Cancer campaign here at Florida Hospital Center Ice. Join in with the cause at the tournament! We are having an actual ‘Pink’ event here on October 20th but are promoting Breast Cancer awareness throughout October. All of our Guest Services staff are wearing the shirts this month and we are selling them in both Pink and Black for $15 each at our front desk. We have all sizes in Youth, Ladies and Men’s. A couple of our teams are wearing them for games, so it’s really cool if any of your teams would like to join in. 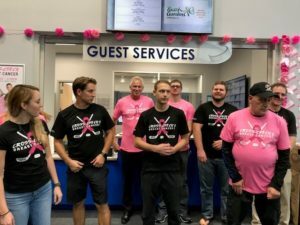 All of the proceeds are going back to a local foundation for women with Breast Cancer in our community through our sponsor Florida Hospital foundation.